While I wear neutrals most often these days, I do enjoy incorporating a bit of color into my outfits. All of the pieces I am wearing in this post are old. Since I packed away 75% of my clothes, I challenge myself in being able to make my old clothes look new by simply pairing them in different ways. I can't emphasize enough how much I love bloggers who remix items. Hopefully, I can show you guys a little something too. Nothing brightens up a dreary morning more than a cup of coffee and a bit of neon =) Hope you guys are enjoying your week so far. 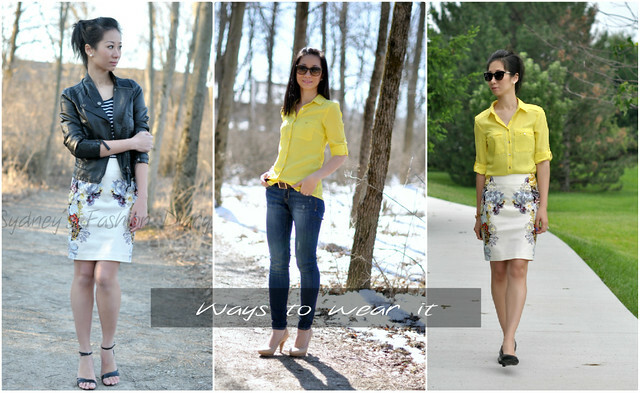 I am participating in Tara's what I wore to work link up today. what a gorgeous pencil skirt - and it just looks perfect with your bright yellow blouse. 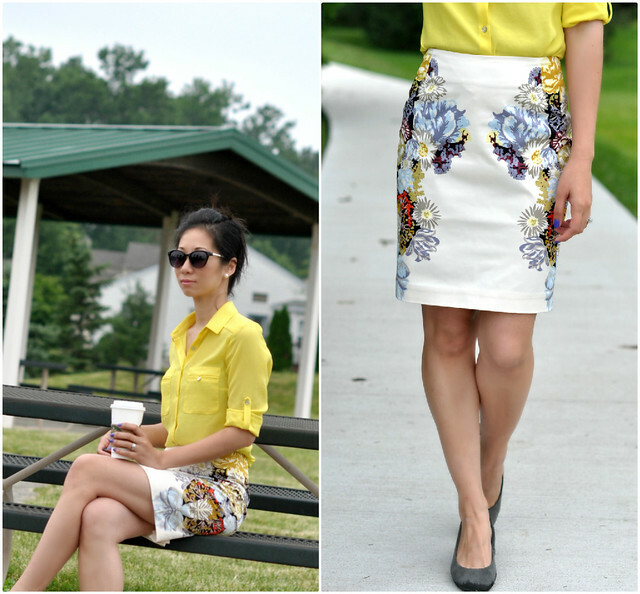 This outfit is beautifully paired with the mostly neutral skirt and bright yellow shirt. That skirt is so pretty, love it with the bright yellow! This outfit is so cute! I have the same skirt and I love pairing it with a chambray shirt (i believe Wendy's Lookbook posted something similar) or a maroon sweater. I recently started to downsize my closet and have been trying to be more creative with my outfit pairings. However, I find it tough when I wake up late and am trying to rush out the door! You look so attractive with yellow colour, I think that is the most suitable colour for you. i love the remixing posts, too. all three of those post pics were beautiful! you just reminded me of my broken coffee maker (broke in the move). i'm crazy sad about it! i need my morning coffee!! i think i'm going through withdrawals. have a great weekend! cute outfit sydney! i love the neon paired w/ the mirrored floral print super chic! you look fabulous hon! ahahah. my phone.. i dunno it might have been charging or something.. i'm really not that tied to my phone.. sometimes i'll leave it at home accidentally.. my husband always yells at me about it.. like what will i do if i get into an emergency hahaha. I have loved that skirt ever since I saw it on ya the first time. The yellow really makes the outfit fun!